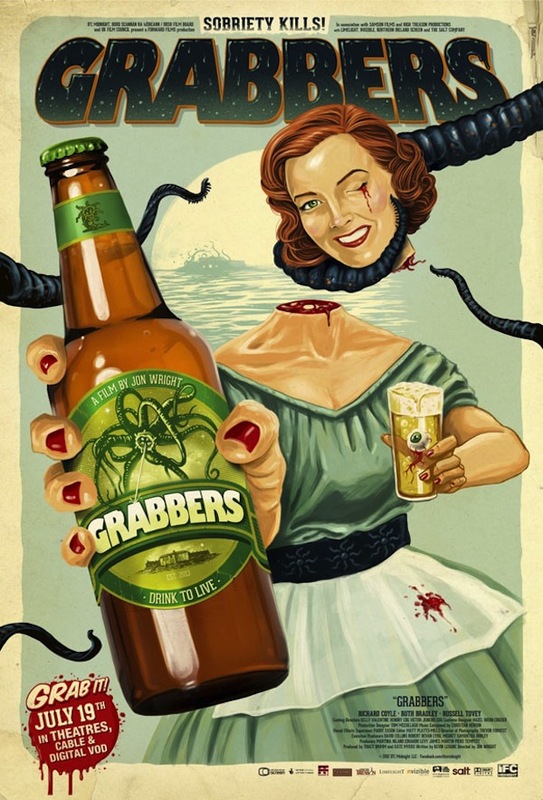 Drink to live in this new poster and trailer for Jon Wright’s Grabbers! IFC Films is getting ready to release Jon Wright’s Grabbers on July 19th through their Midnight Banner in select theaters and of course on VOD outlets. This is an absolutely fantastic looking Irish horror-comedy that has been picking up some steam since playing at Sundance and Fantasia back in 2012. The film looks like a hilarious slice of horror fun in the same vein as Shaun of the Dead and one of the most underrated horror films of all time Slither. Definitely keep your eyes open for this one guys, it’s one you won’t want to miss. Something sinister has come to the shores of Erin Island, unbeknownst to the quaint population of this sleepy fishing village resting somewhere off the coast of Ireland. First, some fishermen go missing. Then there is the rash of whale carcasses found washed up on the beach. When the murders start, it’s up to two mismatched cops— the charming but somewhat work-shy Ciaran O’Shea and his new by-the-book partner from the mainland, Lisa Nolan—to protect the islanders from the giant, bloodsucking, tentacled aliens that are out to get them. Their only weapon, they discover, is booze. If they want to survive the creatures’ onslaught, everyone will have to get very, very drunk. Richard Coyle, Ruth Bradley, Russell Tovey, Lalor Roddy, David Pearse and Bronagh Gallagher all star. You guys can take a peak at the awesome new one-sheet below! This film was a lot off fun. Looking forward to checking it out. Just saw your review! Nice!